Oy, things have been busy. The holidays have come and gone, and I have even more of a backlog of recipes to be blogged. But, today is not the day for that... it's time for another round of Foodie Pen Pals! This month's package came from the wonderful Ashley of My Cats and I (Cooking) in Chi. I was hoping for some healthy-ish snacks (though I'm never opposed to the other kind! ), plus some local goodies (because to me, that's half the fun of getting a package from someone living in a different part of the country). She COMPLETELY nailed it... plus there was a little something extra from her kitties to mine! 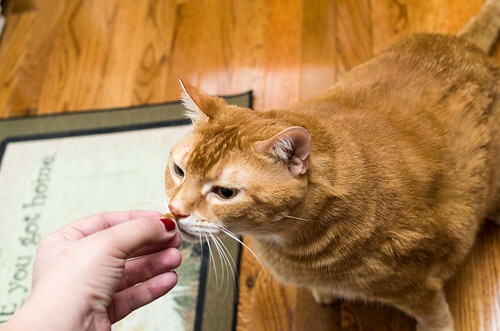 And for the kitties... a little ziploc with Buddy Biscuits cat treats! If I wasn't going to be in Dallas for Super Bowl, I would have made the pea crostini for a party - it sounds so fresh and spring-y and yummy. It'll have to wait for another party, though. I haven't had the GoPicnic meal yet, but it's at work, destined for a deskbound lunch. The almonds are also at work and have been great for my mid-afternoon salty crunchy urges. I hadn't had Pirate's Booty in awhile, so I didn't realize how much I'd missed it - so good! The local (Chicago-area) goodies were the oatmeal, the caramels, and the Vosges bar. I took the oatmeal to work with me and ate it one morning... then immediately went on the Milk & Honey website to confirm that I could get it shipped to me. SO GOOD! The caramels were also excellent; I really liked the Mexican hot chocolate one (I'm a total sucker for cinnamon, chocolate and a little heat all mixed together). And the Vosges bar... I didn't realize they were based out of Chicago! I've been a huge fan of their chocolates for 5 or 6 years, and the very first one I'd ever had was the truffle version of this particular bar... so that was a fabulous surprise! Amber and Orville approve, too! 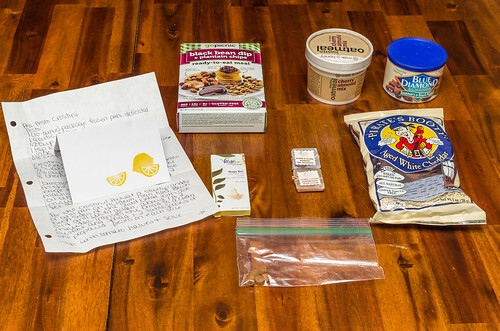 Curious about Foodie Pen Pals? In a nutshell, there are monthly sign ups (so you're not locked in if life gets in the way in any particular month). 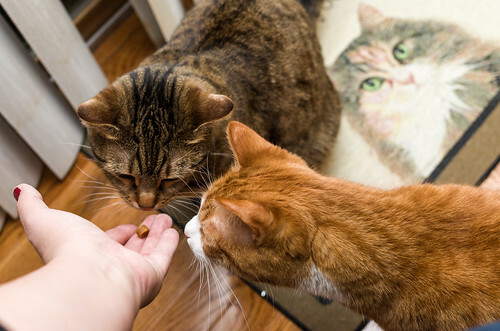 On the 5th of every month, you're assigned a FPP, and you have until the 15th of that month to contact them, get their mailing address and food preferences, fill up a package, and send it their way! The spending limit is $15 before shipping, and the package must include something hand-written (a card, a recipe, etc.). If you're a blogger - on the last day of the month, you'll post a "reveal" (which you can add to the reveal round up on The Lean Green Bean). 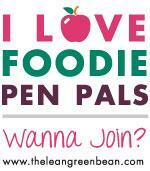 If you're interested in learning more, visit the Foodie Pen Pals page for all of the details!